Q: According to reports, ROK President Moon Jae-in today sent a special delegation to visit the DPRK, which aims to improve the DPRK-ROK relations and create enabling atmosphere for the dialogue between the DPRK and the US on the Korean Peninsula nuclear issue. What is your comment? 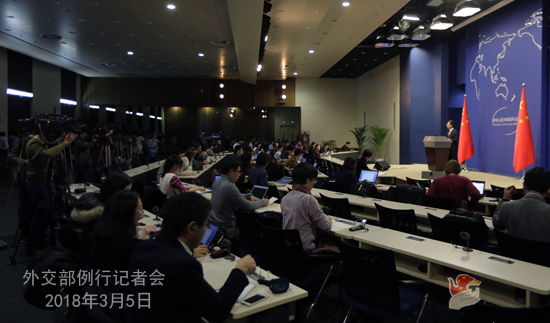 A: Recently, the DPRK and the ROK have taken the opportunity of the Pyeongchang Winter Olympics to actively conduct dialogue and interactions and there has been a hard-won momentum of amelioration for the tension on the Korean Peninsula. China welcomes and supports this, and we have made clear our stance multiple times. The ROK today sent a special delegation to the DPRK to exchange views on relevant issues. China believes that this is good news and hopes to see positive outcomes of this visit. We hope that all relevant parties will bear in mind the peace and stability of the Korean Peninsula and work for the shared goal so that the dialogue during the Pyeongchang Winter Olympic Games could continue as a regular one and the DPRK-ROK interactions could bring about the ones between all relevant parties, especially between the DPRK and the US, and that the efforts to improve the DPRK-ROK relations could lead to the concerted ones that will realize the denuclearization and achieve the lasting peace of the Peninsula. 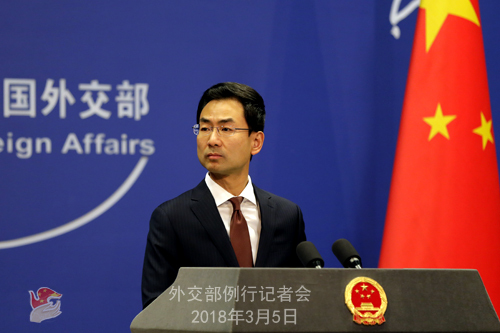 China stands ready to play a positive role to this end. Q: According to reports, Germany's Social Democratic Party said on March 4 that 66% of its members have voted in favor of joining a grand coalition with the Christian Democratic Union of Germany led by Angela Merkel. Reports say that this has cleared the way for a re-run of the grand coalition that has governed Germany since 2013 and ended a five-month uncertainty in Germany. Angela Merkel is expected to begin her fourth term by mid-March. What is your comment on this? A: China has noted relevant reports. Germany is an important European country and China's comprehensive strategic partner in Europe. Recent years have witnessed sound development of China-Germany relations and there is widespread consensus on deepening across-the-board cooperation between the two governments and various sectors of the two countries. China highly values its relations with Germany and looks forward to working with the new German administration to continuously advance the steady development of China-Germany comprehensive strategic partnership at a high level under the principle of mutual respect and mutual benefit and win-win outcomes. Q: According to the exit polls, the 5-Star Movement in Italy was the biggest single party, and the center-right alliance won the most votes. What is your comment on the election? Is China concerned about the danger of instability or populism in Italy? A: We have noted the relevant information about the Italian general election. China and Italy enjoy traditional friendship and are each other's comprehensive strategic partners. During the past forty-eight years since the establishment of diplomatic ties, our bilateral relations have enjoyed sound and steady growth. China attaches high importance to its relations with Italy and we are willing to join hands with the Italian side to move forward bilateral friendship and cooperation.